If you’re a parent of a toddler or young child, you’ll know how hard it can be to find age-appropriate activities that don’t tire them out too much or end in tears! Suzy Lyons from Gardening Northside found the perfect day out for her daughter. Like any parent, when I have the day off with my little girl, I am always looking something new to try. She is three years old, so big activities like days out in the city can be a bit much for her to handle. Plus, when it comes to spending special time together, we often only have that small window between school drop-off and the pick-up of her older brother – and all school mums know how fast that time can fly! But the other week we discovered two places that seem to suit our needs perfectly. They’re great days out for both kids and adults, plus they’re across the road from each other, super cheap and with great coffee for mum. 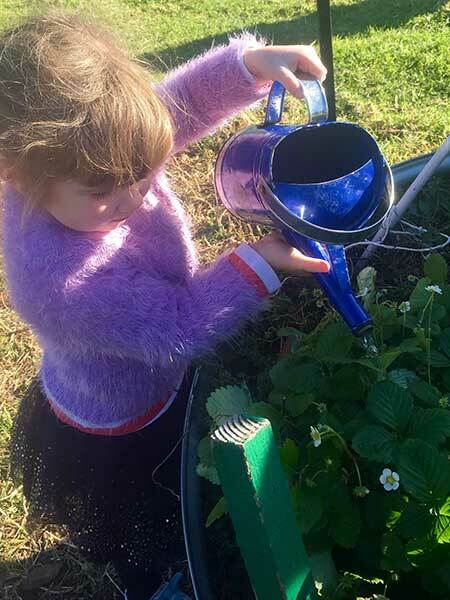 The first place we discovered was a very child-friendly nursery in Ingleside (just past Terrey Hills on the way to Mona Vale) called New Leaf Nursery. There is so much for the kids to explore at New Leaf Nursery. From feeding the chickens, to riding a toy sheep, playing basketball, or just chilling out in the kids tent, set up with couches and loads of toys and scooters, there’s so much to keep them busy and smiling. To top off the appeal, there’s a little coffee bar which serves really good coffee and a few little snacks if you left the morning tea bag in the fridge (which happens to me often)! It’s also a great place if like me, you have a green thumb or if you’re just looking at starting your own veggie garden – loads of edible plants and raised garden beds, chickens, worm farm set ups, guinea pigs, rabbits and a selection of other plants as well. They also have a great selection of pots and plants, water features, garden essentials like great coloured spades and buckets as well as heaps of funky trinkets and secondhand goods. It was great fun trawling through the secondhand section, especially when we came across an old-fashioned fingerdial telephone and the kids just thought it was amazing that mummy had one back “in her day”! 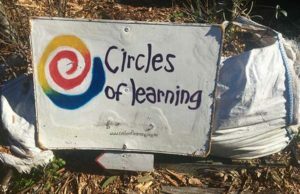 The second great find for the day was across the road where Circles of Learning conduct an amazing program for little kids that is FREE! Yes, you heard it. Free! The hands-program is designed to educate parents on nutritional facts and helping kids build confidence, plus aims to develop ‘children’s high sensory awareness and whole brain learning’. 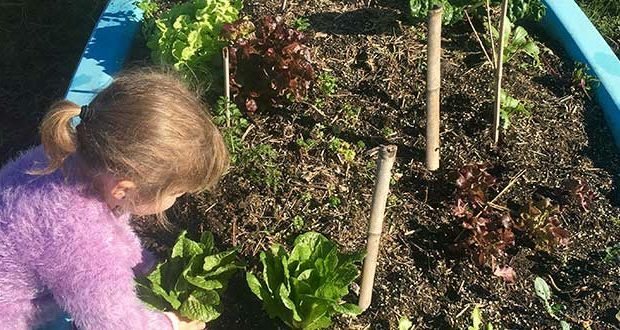 The open area is filled with raised garden beds in which the kids can pick what has grown this week, dig out any weeds or things that have died and plant new seedlings and plants. The program kicked off this week with some breathing exercises where the kids were asked to breathe in and out several times to help promote relaxation. Then we got into the dirt! We were tasked with picking strawberries, tomatoes and broccoli, and cutting the parsley- and we were allowed to eat it, too!Anything that we picked was free for us to split up and take home. Then there was the good old dirt patch. This was essential for most kids to have a good stomp around and get into the feeling of good old mud! At the end we were given a cup we filled with dirt and we were given an offcut of a succulent to plant and take home to watch grow. The kids had a lovely time being outside, learning about where food comes from and how it grows. 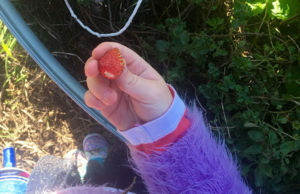 It was fantastic to see the kids be able to touch and taste different things in the garden. It really was a great day out for the kids. And finally, I learnt something new today too! If you have trouble sleeping, cut each end off a banana off, stick the banana in simmering/almost boiling water and leave for 10 minutes. After 10 minutes take the banana out and drink the water! Apparently, it really does work to promote sleep, and you can then eat the banana for a quick pre-sleep snack! Lane Cove National Park: Stunning and something for everyone! What a gem! I like this “Two Nature Activities” article a lot. I can’t wait to try with my kid.